We currently provide a number of office and commercial cleaning services in Dundee. Our team would be happy to help you with any of your commercial cleaning needs. It is important to us that our office and commercial cleaning services are reliable. We pride ourselves in having good strong relationships with all of our clients. As a result, we are pleased to receive a lot of business for commercial cleaning in Dundee through word of mouth referrals. We are truly focused on providing a high standard of office and commercial cleaning in Dundee. Our team know how important it is to our clients that we deliver this service with pride. Whether the commercial and office cleaning you are looking for is for small or large office premises, we are happy to come and meet with you to discuss your individual needs. Our team know how important it is to have a clean, presentable working environment for your staff and visitors. 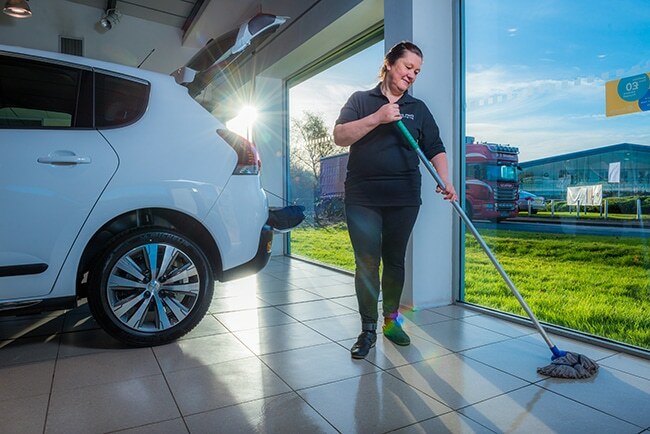 We currently provide commercial cleaning in Dundee to a number of clients that range from large hotel chains to car show rooms. Our team also provide commercial floor cleaning services and window cleaning services to our clients. We are also able to provide our commercial clients with a window cleaning service if needed. Our team can even clean your building externally with our pressure washing services if your building could do with a freshen up. If you would like to discuss our commercial and office cleaning services further, contact us for a no obligation quote. One of our team will be happy to come along and meet with you.